Rio de Janeiro has some of the most beautiful natural settings in the world. In addition to its beaches and surrounding mountains, there are several parks located throughout the city. These parks are quite lovely and make for a glorious afternoon stroll. Flamengo Park has wonderful views of Sugarloaf. The Quinta da Boa Vista just north of downtown was the country home of the royal family. Today, the grounds are filled with colorful flowers, waterfalls, ponds, tall trees and even a grotto, a lookout and a temple dedicated to Apollo. The national museum and zoo are also located on the park’s grounds. The Campo de Santana near downtown is surrounded by a fence and iron gates. The purpose of the security system is to protect the 50 types of trees that call this park home. There are also several agouti living here along with marmosets and peacocks. 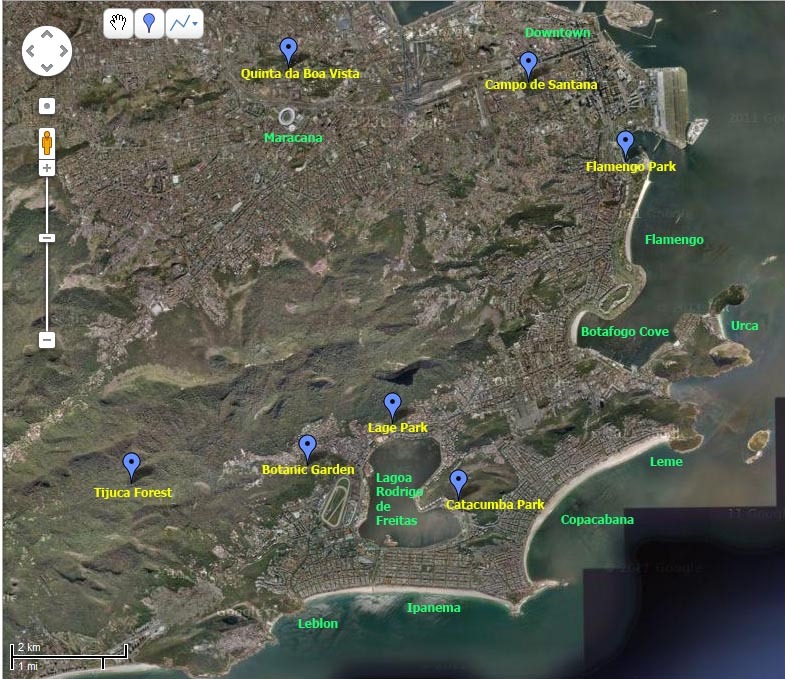 Parque Nacional da Tijuca, also known as Tijuca Forest, is 8,000 acres of rainforest. Right in the heart of the city, divided between the areas north, south and west reaching different neighborhoods. It is the perfect place to hike and take in the incredible flora and fauna. There are several lovely waterfalls to visit or jump in for a swim. 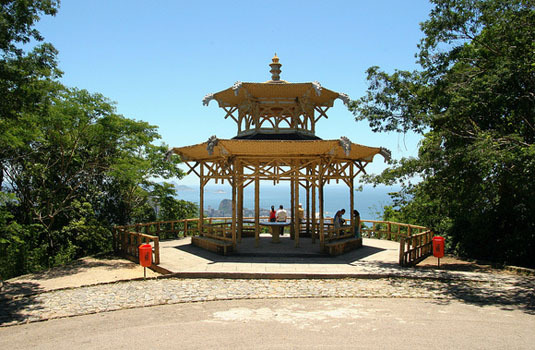 Some of the major points of interest within this park are Pedra da Gavea, Vista Chinesa, Pico da Tijuca and the famous Corcovado.Another place that is worth a visit is Paineiras Road. In this 4 km (2.5 miles) road you can find some of the most incredible views of the city. The road cuts Tijuca National Park and on Sundays it is very popular with families for sports, picnics or just relaxation. Paineiras Road it is only accessible by car and the quickest way to arrive is by Cosme Velho neighborhood. Located in the old property of Lage’s family, a place surrounded by beautiful gardens, in the main house runs the School of Visual Arts of Parque Lage, where are exposed student’s works; An interesting program is to have a breakfast by the pool located inside the School. 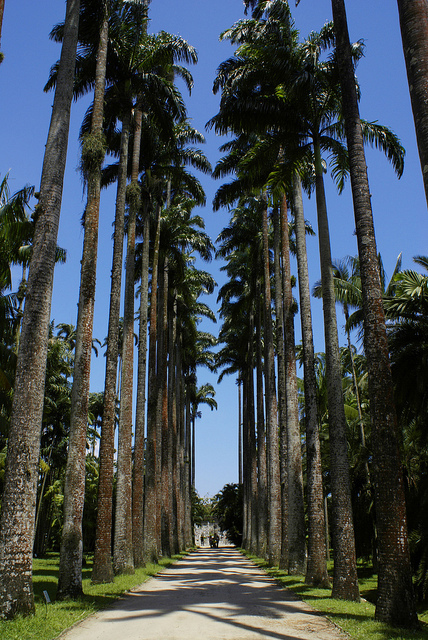 Located only twenty minutes from Copacabana, the Botanical Garden created by Dom João at the time that Brazil was still a Portuguese colony. In the base of the Tijuca Forest and the Corcovado, the park has about eight thousand species of plants and flowers from around the world. 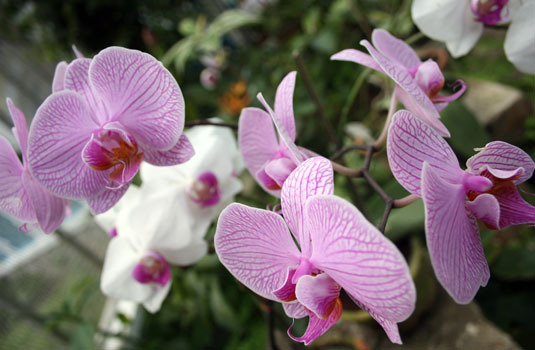 Beautiful and well maintained gardens, amidst fountains, streams and an air of tranquility hold an amazing collection of orchids and bromeliads. Carioca TipsAnother great Parks in the city is the Catacumba Park, located in Lagoa neighborhood. The park has several outdoor sculptures and a space to the practice of adventure sports such as tree climbing and zip line. Throughout the different tracks you can have a beautiful view of and Lagoa sighting even animal species such as Mico Estrela, small primate characteristic of the region.See how you can explore the natural beauty of Rio and beyond by checking out the Tours in Rio available at Rio.com.